We're committed to monitoring the quality of the services and products we provide, as part of an ongoing improvement process. We would appreciate your feedback on your experience while visiting our store. 1. Which of our locations did you visit? 2. Please rate your store experience on a scale of 1 to 5 where a 1 represents "Extremely Dissatisfied" and a 5 represents "Completely Satisfied." 3. Please consider your interaction with our sales staff when answering the following questions on a scale of 1 to 5 where a 1 represents "Strongly Disagree" and a 5 represents "Strongly Agree." I was greeted promptly upon entering store. The sales associate listened to my needs. The sales associate was knowledgeable about the merchandise. The sales associate was available to answer any questions. 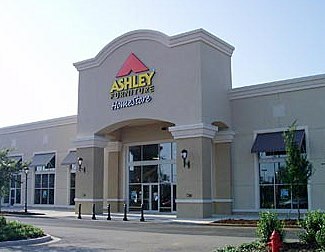 Ashley is able to offer Ashley Direct pricing which means substantial savings to the customer? 5. Did you make a purchase during your visit?